Even Happier Hour, Royal Foundry Craft Spirits, Minneapolis. April 4, 2019. April’s Even Happier Hour last night at the fabulous Royal Foundry Craft Spirits was just brilliant. Thank you to Lauren Engfer for the beautiful photography! Our self-confidence all stems from our heart. But sometimes, what's stopping us from listening to our heart (let alone healing it) feels so BIG, that we just don't even start the healing. Led by herbalist Clare Gardner Nieto, this workshop was a perfect intro on how herbs can help with change. Clare explained how our bodies can react to different herbs even if they lie on our skin (let alone what we eat every day), and how to mix herb combinations to give our bodies what they crave. We made our own mixes of different herbs and learned how to "pulse test" with each other - it's hard not to make new friends when you're touching someone's wrist! Clare also spoke from the heart about her experience in healing her own pain - as well as her dramatic career change story from a global project manager to a herbalist. 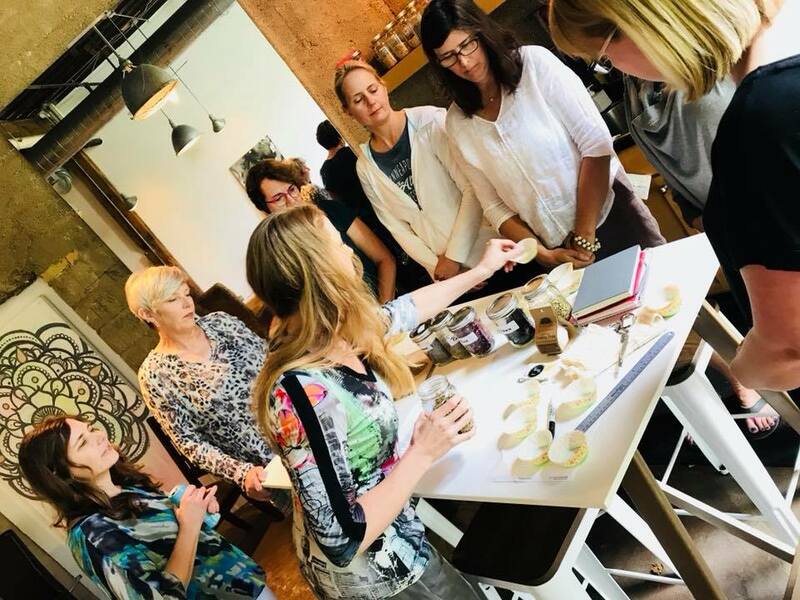 In true Buzz Session style, stories were shared about change and "life" was left at the door for a few hours while we gave ourselves permission to explore new ideas and reconnect with our own needs. Thanks to our venue, the wonderful Anahata Collaborative in Uptown Minneapolis and to Cocco Consulting, our sponsor. French born, San Francisco based Dominique Crenn was the first woman to be given two Michelin stars for her work at Atelier Crenn, where her menus are poetry (literally). Her career path has involved ballet, softball, international business ...finally, she has rested on food as a way to express her creativity and to create a sense of family. In this intimate event, crowded with young and famous chefs alike, Dominique spoke about how we all need to step up to fight for freedom, we all need to call out injustice when we see it, and we also need to have courage to follow the vision in our heart. Read more of her story and approach to food here. When you're changing something in your life, you need some serious resilience. What's more, making the decision to MAKE change happen is often just the beginning of a long road. People are going to let you down. You're going to ask for more than you've ever asked for in your life. People will be jealous of you. People may not like every post you write, every produce you sell, every new class you take, every new way you choose to spend your time. While the reward of change can be incredible, it can hurt like hell along the way. And, so many give up because of it. Yet, resilience can be built. We can build it inside of us. And building it with a community can help us be even stronger. So, that's what this Buzz Session was all about. Coming together to be WAY out of our comfort zones, to learn how to imagine strength. To feel the space we take up. To be forced to instantly trust a stranger, and to feel what's it's like when that trust is returned. National stage combat coach Annie Enneking led us in 90 minutes of learning how to fake hair pulls, slaps, punches, shoves....how to feel strong even if we felt silly or unsure. Then, we partnered to put on a "fight" - watched by everyone (eeek!!). Many of us hadn't laughed that hard, or encouraged as much for months. Another is recently married but is now facing her husband being deployed. She knows she needs a different kind of community around her. Another is coming out of a recently finalized divorce with a promise to herself to try new, challenging activities. Heartfelt, special, authentic. Plenty of resilience to go around. What happens when women share their stories about change, entrepreneurship, struggle, doubt, hesitation, courage and hope? A great deal of connection and common truth (as well as some "WTF?!" moments!!) This event - hosted by Bumble, who are soon to launch their Bumble Bizz service for women - showed that we all have far more in common than we think. That no-one has it all figured out. That we all need each other's faith, understanding and support to FIGURE it out. Oh - and that it's an ongoing journey for all of us. Thanks to Alex Steinman, President of Mpls MadWomen for guiding our conversation! When you were taught to "respect" books, the idea of painting over old children's books and writing (then ripping) up old pages of others can be nerve-wracking! Yet, this was all part of the experience of getting out of our comfort zone in today's Buzz Session. Led by DeAnne Olguin Williamson, a multi-media artist originally from California, this session was all about rediscovering joy. We used old children's books as a base, smeared the pages with paint, journaled our reminisces of joy on brown paper, ripped up old dress patterns, stenciled shadows of women from carbon and stenciled to high heaven. It was quite the process. What was most special about this session was the sharing of stories, hopes and even less-than-joyous-current-situations with a group of other women who all understood. By the end of the session, every single journal was different, yet each had a common theme - how we all are reaching towards something different. 35 women, all with something in common. Successful, positive, intention - all with 10+ years career experience under their belt - all wondering if there is a way they can make their careers more meaningful, more fulfilling, more damn fun. Led by Lisa Brezonik, CAO and co-author of "Fire Yourself - Plan your career with intention", we heard her story of early success, then 4 kids, then a leap into a life as an entrepreneur, then a chance to write a book based on her executive coaching method. It was during this time that she followed her own advice, and figured out what career she really wanted next. As usual with a Buzz Session, the energy of the room was magic as women opened up to those who had been strangers barely an hour before, getting support and validation in spades. Amy, looking to return to work after 10 years and 3 kids knows she can slot right back into a corporate job. But is grappling with what would really make a difference to her. Brenda, after being promoted countless times in a challenging logistics job, is searching for different ways to use her skills that do something for her - not just for her organization. Stephanie, knows her passions of food, travel and is working up the courage to follow a career path in those areas, instead of the ones she feels she "should" take. The biggest lesson? Many women started the session by saying they were looking for courage and inspiration. Well, we saw it, right there, in that room. We bundled it up, stuck a huge red ribbon on it and gave it to each other saying - take this massive gift, this self-belief and..... GO! We also enjoyed two Passion Pop-Ups - one from Stephanie Gilles who has just started as a BeautyCounter consultant, and Katie Murphy, an India Hicks Ambassador. Huge thanks to the Food Building who donated their awesome event space to us. Every one of our Even Happier Hours has been different. Yet, what surprises us every time are the women who come, intentionally, to share and learn. 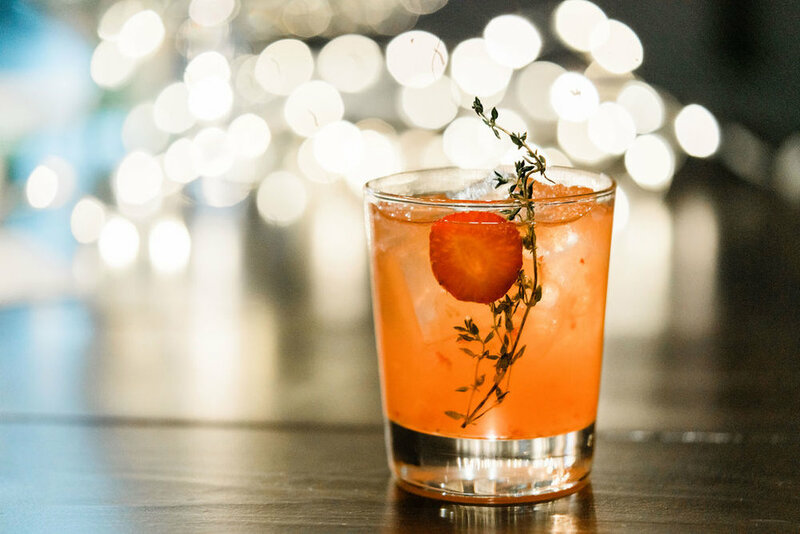 Those who walk in to a new place, knowing no-one, who just want to "give it a shot", and who, 30 minutes later are sharing some of their deepest hopes about what they want to do with their life and guffawing with the best of them at the bar. Glennon Doyle Melton - "Broken Lives, Courageous Living"
It had been a helluva day. Work had been non-stop, I'd barely eaten and the week was getting away from me. But, I had committed to go to see Glennon Doyle Melton - someone I didn't know much about until fellow Passionado Stacy forwarded the invite to her talk. Flying into the packed church with minutes to spare, I wondered what the night would bring, and if my mind would calm enough to let me enjoy it. Would it be a worthwhile night? 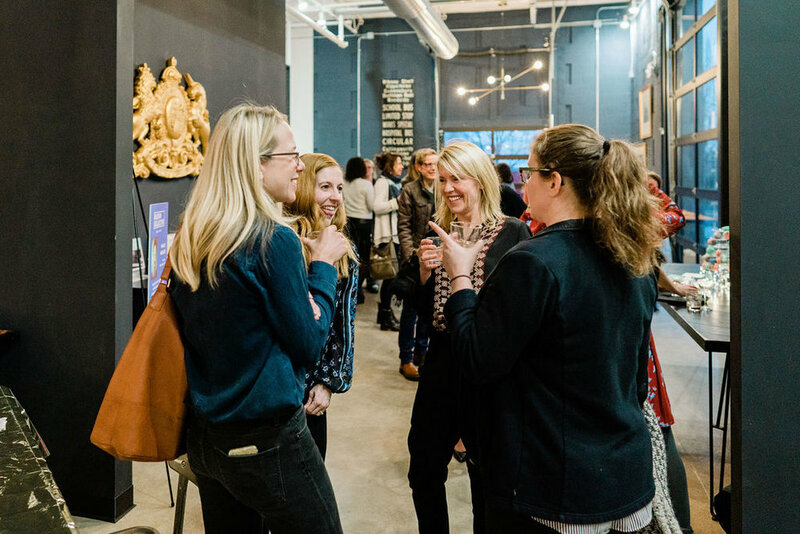 Tonight, at the Westminster Town Forum in Minneapolis, was that night, where Glennon Doyle Melton, author, speaker and founder of online community Momastery spoke about life. Life as a woman. Life as a bad friend. Life as a failed wife. Life as a mum trying to do what's right. And how it resonated. Receiving several standing ovations, she talked about as women, as friends, "we are feel like failures because we have the wrong job description". About how we're all trying to run away or protect ourselves or our loved ones from pain, when actually, we need to sit with it and run right through it. That if we know what makes our heart break, it can help us get to our purpose in life. That when raising daughters, we can help them become who they are meant to be, by saying to them "I can see your pain, it's real. I can see your strength, it's bigger." Click here to listen to the full length recording of Glennon's talk - thanks to MPR. Buzz Session: "Just Say Yes!" We're so busy leaning in, saying no, living in the moment, being courageous, getting me time....how the hell can we say yes more? But what happens when we do? 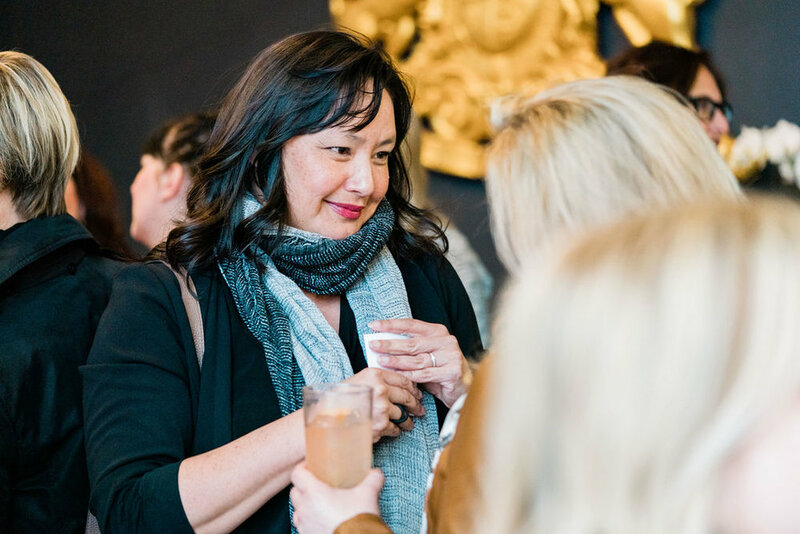 Inspired by Shonda Rhimes' bestseller "The Year of Yes", our SOLD OUT event (!) saw women share their stories about saying "yes" to things that - initially - made them uncomfortable, scared or unsettled, but how those decisions moved their path in ways they could not imagine. From Trish, who emerged from a tangled divorce to put herself on a stand-up comedy stage. From Molly, who decided to use her faith in people and happiness to create a "sidekick" movement. From Jamey, who is saying "yes" to leading her family's construction firm. Allison Ballou, professional coach, led us in an exercise to commit to our "yeses" - some incredible moments where the group celebrated the guts of those who stood in front of the room to claim what THEY want to do! And here's what we all said.......amazing, right?! Our two pops up, from Katie Murphy's India Hicks business and Jen Kreilich's new J.Lux jewelry line not only added extra glamour but also inspiration to those who are teetering on the edge of "but could I..? As ever, the magic came from the connections made, support given, plans made and ideas seeded. Fantastic!! "Responsible Journalism in a Polarized World"
Did you know that the first woman news anchor to wear a hijab did so in 2009 in Minnesota? Her name is Mnar Muhawesh and she spoke to a small group this Sunday about her path to journalism and activism. After the first part of her childhood was spent in comfortable suburbia (Maple Grove), her father decided to move the family back to Palestine. Soon afterwards, the Second Intifada broke out, throwing her family into a war zone. After living through several years of unimaginable upheaval Mnar's family returned to Minnesota. Mnar tried to stay in touch with the unrest in Palestine through the media but found the coverage misleading and hard to find. The only way she could change this was to be part of the solution. After graduating from a top 10 journalism school (St Cloud State), she began her career as an intern at TV station KARE then as a freelance journalist. After posting her work on a blog, in 2011 she launched her own news site. That site is now a global non-partisan news service called Mint Press News. Mnar’s mission is to “challenge the narrative” of regular news and to give people another point of view. She’s articulate, knowledgeable, calm in her debate. Her news site and her views have courted controversy and she’s not afraid to speak her truth. Now, about that hijab..... Mnar acknowledged that many see it as an instrument of female oppression. Even her parents told her that "no-one would have her" if she wore it to do her job. To Mnar, her hijab is a symbol of her independence as much as her religion. With a fully supportive husband and father and a belief that Muslim women are as strong as they come, it is not an issue for her. Instead, Mnar has come up against massive gender issues in her industry (the media is not exactly known for being fully inclusive), as well as political attacks against her team and work. Despite this, she firmly believes that when it comes to women and change, “we have it in us, it’s here” and that you can “find courage in crisis." Find out more Mint Press News here. Buzz Session! Fitness: more than the numbers. We all know we need to be healthy and fit if we want the most out of life. Many of us crave it, want it. Some of us view it with a begrudging respect. Feeling better about ourselves often helps give us confidence in changing other areas of our lives, we know that. So why is it so hard? The positive energy we felt - like-minded women, sharing their stories, encouraging each other (even lying on the parking lot floor to demonstrate a stretch) - is testament to how strong we can be when we do this together. A huge thanks to Michelle Trombetta for the her generous photography genius (all pix are hers) and to KIND for their sponsorship. Mary McCarthy, CEO at Glorious Hugs (and Passionado! ), attended this event now in its third year. Drawing women from across the state, its focus was on strategic partnerships. Kicked off by keynote Monica Nassif, founder of Caldrea and Mrs Meyers, the seminar featured success stories and lessons learned, along with practical advice on finance and creating strategic partnerships. 1. Use images to tell your story. Create a collage. 2. Believe in abundance. There is enough for you and everyone. 3. Write down all the negative things that people say about you. Own the descriptors that you want to own, especially the ones that make you strong and badass. Then edit the list to reflect who you are and want to become. 4. "Our humanity is more powerful than any strategy." 5. In looking for strategic partnerships, first identify the potential problem a partner can solve then look for the best partner who shares your values. Learn more about Carlson's MN Cup here. Women, wine and whiskey - tonight's event was a fun mixture of serious conversation (how to build a personal brand, how to get a business of the ground, how to persist even when creating something is really fri*&ing tough, how to avoid dodgy resume builders) to the fun (how to spend more time on vacation, family, love, food, friendship). It was quite the way to celebrate having freedom and independence as women who are "figuring it out". Thanks to The Lowry for hosting! Our first Buzz Session was all about confidence - but not the self-help-book-just-smile-and-you're-happy stuff. 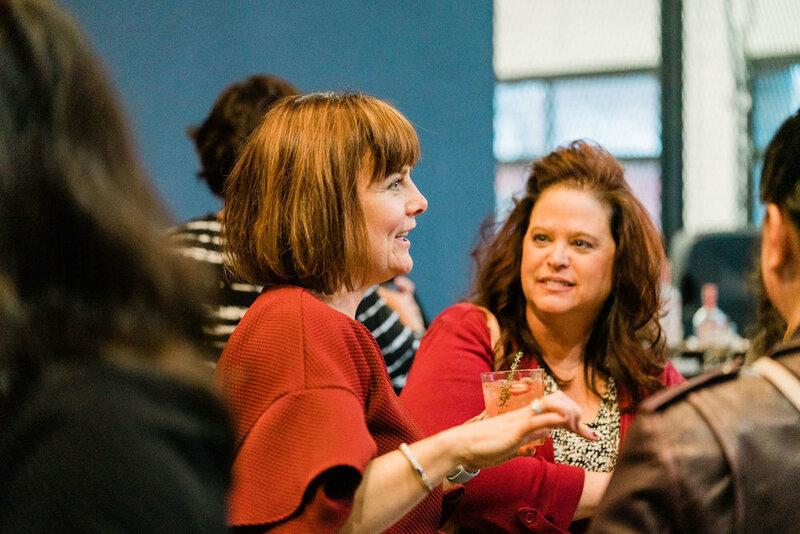 With the help of Professional Coach Allison Ballou, 15 women gathered on a frozen January night to learn more about true confidence - that feeling that allows others to feel inspired, appreciated and grounded around us. We shared our stories about the barriers that hold us back from building our version of confidence, learned situational strategies for when we feel self doubt and experienced a mindfulness exercise that helps us remember how we want to feel when at our best. We left with new connections together and also a renewed sense of warmth and hope that as Allison told us - "No-one is you, and that is your power!". "Great insights, I read a lot and attend seminars, etc. You presented something fresh and highly relevant." "I normally find these types of topics hard to sit thru - but you bring a very real element to this content that made it truly engaging and close to home." "VERY good content. It was practical, actionable, interactive, perfect for this group. Fantastic job!" Our goal at Passion Collective is to empower women to change their lives, and with the news of the refugee crisis on our front doorstep, we wanted to help more. So, we donated all of our proceeds from this event to the International Institute of Minnesota who are helping many families coming to Minnesota from foreign lands in the middle of winter. Our Holiday Hurrah was huge fun - plenty of sparkles, new faces and talk of careers, frustrations, fun, relationships, family, how to do more, how to do less - all amidst the energy of Tattersall - itself only having been open 6 months but seeing success as a hidden gem in NorthEast. If 2016 is anything like this group of women, we're in for a treat! What an incredible first Even-Happier Hour! So many smart, passionate, motivated women showed up to meet new friends, reconnect with former colleagues, support each other's opinions and ideas and most of all, share the love. Onward!